I’m not sure when it happened, but Valentine’s Day has become more infused with candy and sugar than Halloween. Between the bags full of lollipops, sweet tarts, chocolates and other treats the kids get from their classmates at school, friends and neighbors, it’s like a several day surge of sweets. It’s time to try and put the brakes on and focus a little more balance with all the ooey gooey love. This year I’m throwing a surprise Valentine dinner for the kids and our family (hopefully none of them will be reading this) filling the dining room with a hundred balloons, the table with flowers and tons and tons of everyone’s favorite foods. For dessert I want to offer something that’s light and healthy, yet also fulfill that itch for something sweet after dinner. Honestly, this could also be served for breakfast it’s so light and naturally sweet. 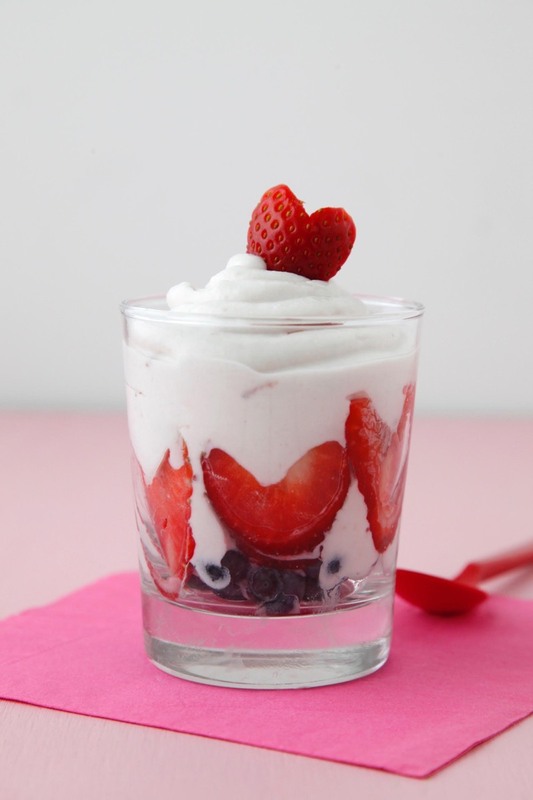 By mixing a touch of strawberry preserves into plain greek yogurt, trimming a bunch of the strawberries into heart shapes and tossing a handful of blueberries in for added color and texture you can create a decadent parfait that can be prepared hours ahead giving you time to focus on the rest of your meal and of course, all of the love! Are you doing the whole Valentine's Day Dinner at home thing too? Share your menu in the comments below! 1. Divide blueberries between 4 small (about 7-9 ounce) cups. 2. 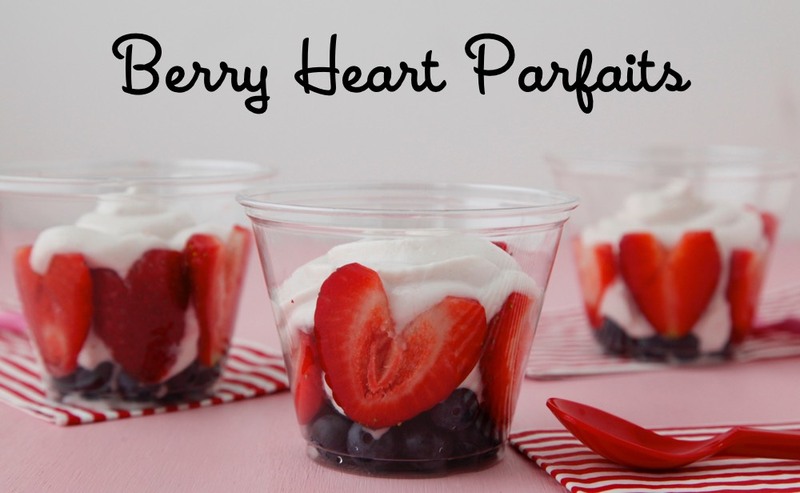 Slice the strawberries lengthwise and then cut a notch in the top to form heart shapes. 3. 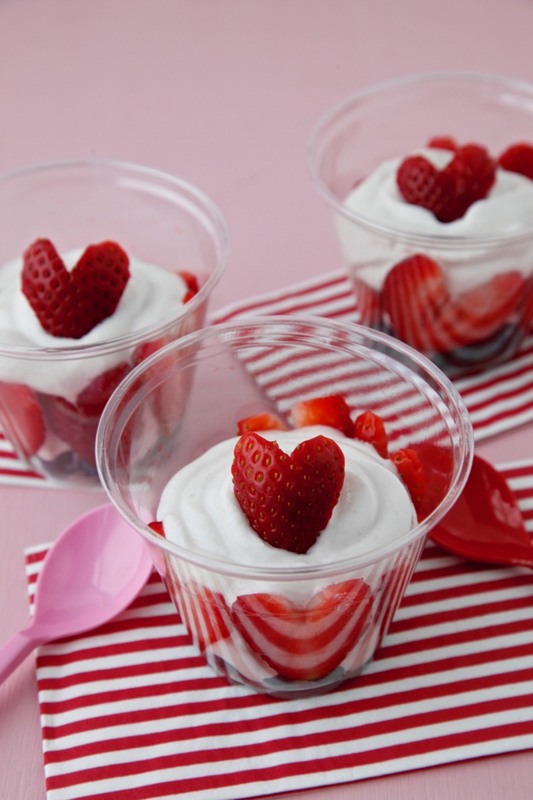 Place 5 strawberries inside the cups so you see the heart shapes through the glass. 4. In a small bowl, stir together the yogurt and preserves. 5. Spoon the yogurt mixture into the cups on top of the blueberries. optional toppings: an additional heart strawberry, mini chocolate chips. Any substitutions for the greek yogurt? I just made these for my 4 and 6 year old- they loved them! 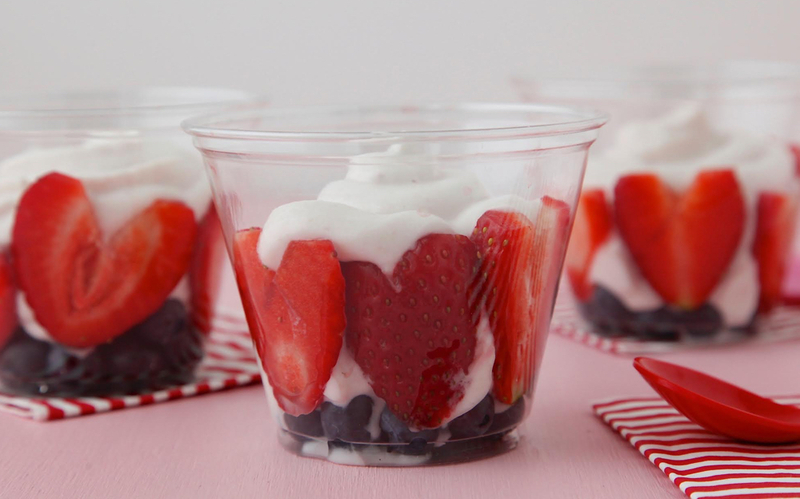 I'm making them for my sons kindergarten valentines party- thanks so much for the healthy treat alternative! I have a feeling they are going to be a big hit! Cream cheese mixed with cool whip might work. You could even use graham crackers crumbs sprinkled on top. 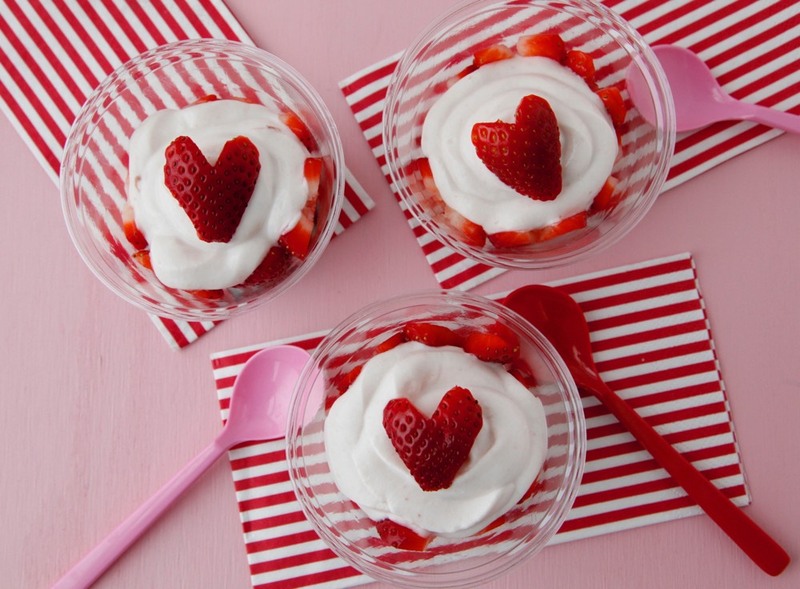 SO cute - love the heart strawberries! How totally adorable are these?! My kids would love them! This is the perfect treat alternative to all of the candy- not to mention totally adorable. I love these! Hearts have never looked so tasty or adorable for breakfast!! What a precious way to start Valentine's Day! Those are so sweet! Louisa adores whipped cream so she wouldn't notice at all that there's no candy involved. Yum!